Please be aware of the latest fraud alerts below. It has come to our attention that criminals are contacting members of the public purporting to be Investec. Please be aware that this is scam and they are attempting to steal money, you should not engage in any communication with these criminals and under no circumstances should you send any money to them. 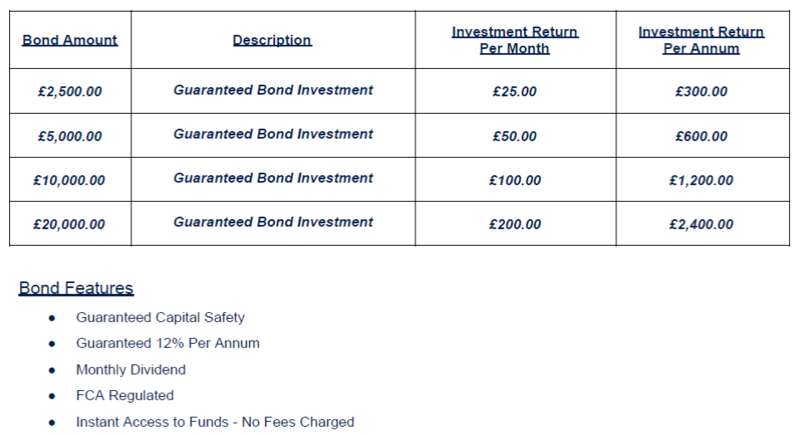 The website link contained in their offering document re-directing members of the public to www.stephenstrugnell.com. The emails have been signed by a Sarah Reid (alias). If you receive an unsolicited call, email or text from anyone claiming to be from Investec Asset Management Limited or another Investec Group Company, please contact your usual Financial Adviser or alternatively contact us via email on enquiries@investecmail.com or telephone +44 (0) 207 597 1800. 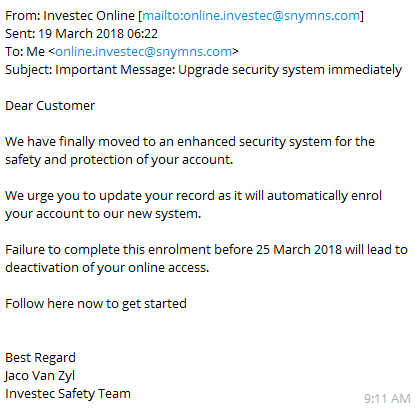 It has come to our attention that fraudsters are emailing members of the public purporting to be the system security and online teams of Investec. Please be aware that this is a phishing attempt and the attachment should not be opened and no links should be clicked on in these emails under any circumstances. The email may contain a malicious file attachment named: investec.htm or the email may request you click on a link. By completing these fields does not mean the above mentioned person/persons agree/s to participate in any type of investment product presented by Investec Asset Management or any associated partners. Any further information requested is solely on a "Non-Obligation" basis and does not mean the above mentioned wish to continue, purchase or proceed with any type of investment presented by our company. These emails are purporting to be from The Administration Department, Private Clients, Investor Relations, Investec Asset Management. Please note the fraudsters have copied the URL from our website into their scam email template and are impersonating genuine Investec Asset Management employees. These emails are not from Investec Asset Management Limited, nor any other Investec Group Company. It has come to our attention that criminals are sending fraudulently certified anti-money laundering Identity documents to various financial institutions. The fraudsters are requesting that the financial institution amends “their” personal email and telephone contact details held in the Firm’s records. The identity documents are fraudulently stamped with an Investec Asset Management Limited (“IAML”) certified true copy stamp with the certifier’s name being Christina Stables, who is a genuine IAML member of staff. If you receive any certified identity documents purporting to be from a genuine client that appears to have been certified by IAML and you have any reason to doubt the authenticity of the document(s) received, please in the first instance contact your client via known contact details to verify the validity of the instruction and documents received. If you receive an unsolicited call, email or text from anyone claiming to be from Investec Asset Management Limited (IAML) or another Investec Group Company, please either contact your usual Financial Adviser or alternatively contact us via email on enquiries@investecmail.com or telephone +44 (0) 207 597 1800. "Good day, the job you applied for has been secured either in [banking/IT/Admin- Secretarial/Cabin Crew/Shipping Clerk]and offered to you, what is just remaining is the credit background check and please pay R295 so that we process it immediately i.e if you know your’e not blacklisted, to FNB account number 62702655335 account names INTERCASH TM and use your ID number as deposit reference, please fax proof of payments and your current physical address to 0867609509. Do it immediately for you’re to start work immediately, deadline is 15th august 2017. Whatsapp only 0738126084"
MAUDE STREET SANDTON JOHANNESBURG 2196 / STEPHEN DLAMIN ROAD MUSGRAVE CENTER DURBAN 4001. It has come to our attention that fraudsters are writing to members of the public advising them that they have won a prize in the European, African and USA Consumer Sweepstake Lottery. The fraudsters are sending the recipients a cheque to help them pay the advanced processing fee. We are aware these fraudsters may be asking victims for their home address to send a courier to collect the processing fee and give them a cheque in the amount of US $250,000.00. It has come to our attention that fraudsters have established a number of fake Investec websites including those listed below. Please do not respond to emails, social media or internet links to these fake sites as you will not be corresponding with Investec Asset Management. If you receive email, social media or internet links to any of the above sites, please either contact your usual Financial Adviser or alternatively contact us via email on enquiries@investecmail.com or telephone +44 (0) 207 597 1800. If you have been a victim of this type of fraud, please report this to your local police station or the National Fraud Intelligence Bureau (NFIB) (http://www.actionfraud.police.uk / Telephone: +44 (0) 300 123 2040). Please also refer to the City of London Police Economic Crime Division and the Metropolitan Police websites for more information or if you are not in the UK, contact your local police force. We are aware that members of the public have received letters, claiming to be from Kim McFarland of Investec Asset Management, requesting charges relating to the delivery of a portfolio to their name. These letters refer to a London agent called Anthony Coles. Please note these letters do not come from Investec Asset Management and are a fraudulent attempt to obtain payments from individuals. If you have received a letter of this nature please contact your regional Investec office or if you are based in South Africa please consult the South African Police Service.